The quality and quantity of surface water and groundwater continues to be a central issue for our region. Both the marine and freshwater environments are strongly affected by changes to flow and water quality as a result of current land management practices, and water use in irrigation, urban development and mining. 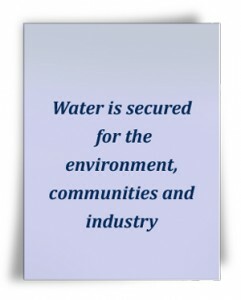 Since the previous NRM plan was released in 2005, substantial investment has led to a greater understanding of critical water issues such as quality, runoff, appropriate allocation allowances and management techniques. 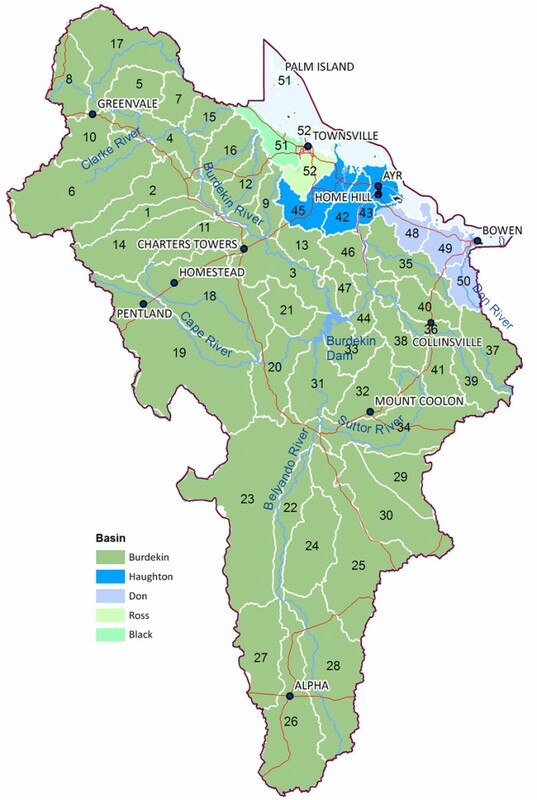 Our region includes five river basins: the Burdekin, Don, Haughton, Ross and Black rivers, which are defined into 52 sub-catchments (see Figure 10). Our region’s surface and ground waters are primarily defined by the catchment of the Burdekin River, which is the second largest river catchment on Queensland’s east coast, and delivers nearly a third of the annual freshwater flow from all catchments into the GBR Lagoon (Water Planning North, 2010). The Black, Ross, Haughton and Don basins are all significantly smaller than the Burdekin and collectively make up approximately six per cent of our region. The Burdekin, Haughton and Don basins are dominated by a mostly rural environment, while the Black and Ross basins are mostly urban and peri-urban. River flows are highly variable throughout the year and between years, reflecting the summer monsoonal season and periodic large rainfall events associated with storms and cyclones. High flows may be followed by extended dry periods. Rivers typically flow from the west to the east coast, and annual rainfall declines rapidly when moving upstream, from over 1000mm/yr around the north east coastal ranges and eastern coastal plains, to less than 500mm/yr in the south west of our region (Roth,et al., 2002). As a consequence, even the main rivers are ephemeral over much of their length, although water infrastructure has modified some river flows, and systems may be inundated with water for most or all of the year. Surface water flows and wetland hydrology are highly-modified within the Burdekin, Haughton and Ross rivers due to dams, weirs, water extraction, tidal barrages, constructed drainage networks and ponded pasture bund walls. part of the Greater Western sub-artesian area. Western areas of our region (Galilee Geological Basins) are a recharge source for the groundwater of the Great Artesian Basin, which underlies 22 per cent of Australia. The basin lies largely beneath arid areas where groundwater is the only reliable source of good-quality water for human activity, and supports important natural ecosystems, including significant mound springs. Regional groundwater vulnerability mapping developed by the Queensland Government identifies the sensitivity of groundwater sources to potential pollutants. Figure 11, shows that groundwater most vulnerable to potential pollutants occurs mostly in the upper reaches of the catchments and the lower Burdekin River floodplain. Land use mapping for the corresponding areas displayed in Figure 8 show that the upper catchment reaches are relatively undeveloped and any impact from potential pollutants (such as fertiliser and pesticides, septic tank effluent, landfills) would be isolated to townships and mining activities. However, the groundwater in the Lower Burdekin catchment, supports significant irrigated cropping which has led to a degradation of ground water quality. 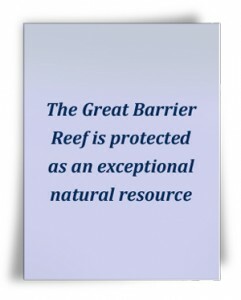 This is discussed further in the Lower Burdekin catchment section and the Burdekin WQIP. 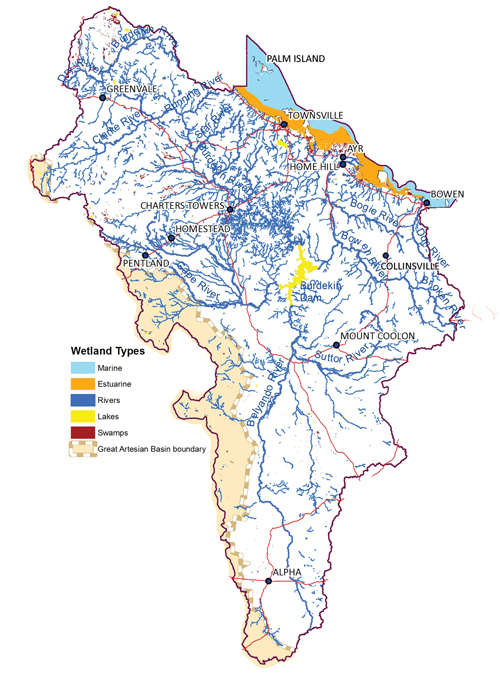 Aquatic ecosystems in our region include rivers and wetlands (Figure 12), many of which are listed in the National Directory of Important Wetlands, including the significant inland freshwater wetlands – Valley of Lagoons and the Scartwater aggregation. Further east, the Townsville-Burdekin wetland aggregation is one of the most extensive on Australia’s east coast and includes the Bowling Green Bay Ramsar-listed wetlands (Environment Australia, 2001). These wetlands play an important function in the landscape and in the health of the GBR by removing excess nutrients, chemicals, pollutants and sediment before they reach sensitive seagrass communities and near shore coral reefs. Many popular and important commercial and recreational seafood species, including Mangrove Jack, Barramundi, Mullet, eels, crabs and prawns, also depend on these wetlands and waterways for habitat, and other parts of their lifecycle including mating, spawning and dispersal. Our region’s freshwater rivers and streams drain a diversity of tropical landscapes including semi-arid drylands, wooded grasslands, mountainous tropical rainforests, coastal plains and wetlands. They are essential for environmental, agricultural and other anthropogenic uses. While work has occurred over the last 10 years on understanding water quality and downstream impacts on the GBR, in-stream health of our waterways linked with catchment scale land capability is poorly documented. In many freshwater ecosystems, the key influences on aquatic ecosystem health can be factors other than water quality, including habitat degradation and changes to natural flow patterns (peak flows, base flows, no flow periods and seasonality of flows) caused by humans. 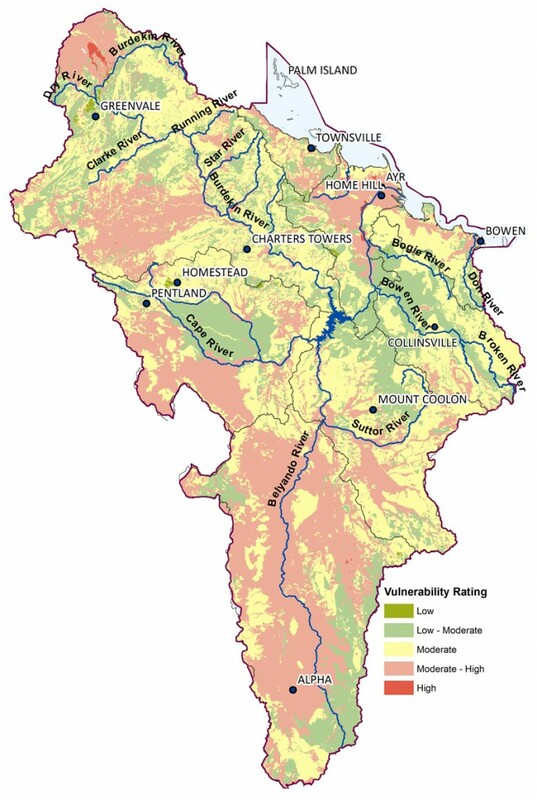 It is important that as well as water quality, biological indicators of the health of in-stream flora and fauna, habitat indicators (riparian and instream habitats) and flow indicators are considered in monitoring and planning programmes in our region. 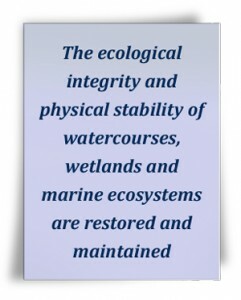 Further information on regional aquatic ecosystems, their attributes, threats, and actions being undertaken to improve their overall health is described in the Biodiversity section. Basins, Catchments & Sub-catchments of the Burdekin Dry Tropics. Directory of Important Wetlands in the Burdekin Dry Tropics region.